(CNN) -- The company that produced the peanut butter linked to a nationwide salmonella outbreak said late Tuesday that it was voluntarily recalling all products made in its Blakely, Georgia, plant. Salmonella bacteria are transmitted to humans by eating contaminated foods. The Peanut Corporation of America, a peanut processing company, made the peanut butter sold by King Nut company. Health officials in Minnesota have said that salmonella they linked to an open container of King Nut peanut butter was the same strain of bacteria responsible for the apparently ongoing outbreak, which has infected at least 434 people in 43 states. However, the King Nut product is unlikely to be responsible for the entire outbreak, since it distributes its peanut butter only to food service companies in just seven states: Ohio, Minnesota, Michigan, North Dakota, Arizona, Idaho and New Hampshire. "We deeply regret that this has happened," company president Stewart Parnell said. Over the past few days, Food and Drug Administration inspectors visited the Blakely plant, where they took hundreds of samples for testing, Parnell said. The salmonella outbreak has been spreading across much of the country since September. 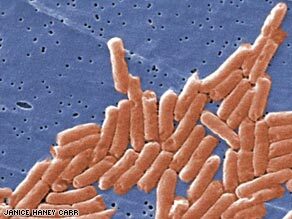 Salmonella enterica serotype Typhimurium played a role in the deaths of an elderly person from southwestern Virginia and an adult from northern Virginia. The third death was a nursing home resident in her 70s in Minnesota. All three of the patients who died had underlying illnesses that could have contributed to their deaths, state officials said. The Centers for Disease Control and Prevention, in a written statement, has called peanut butter "a likely source" of the infections. But it said that no association had been found with common brand names of peanut butter sold in grocery stores. The first cases of salmonella were reported September 3, but most occurred between October 1 and January 6, the CDC said. About 18 percent of cases were hospitalized as a result of their illness, and patients have ranged from 2 months to 98 years of age. CDC spokeswoman Lola Russell said a preliminary analysis suggests peanut butter as a likely source of the outbreak. No cases connected to the outbreak have been reported in Montana, New Mexico, Louisiana, Mississippi, South Carolina, Florida or Alaska. Very young people, older people and those with compromised immune systems are most vulnerable to severe side effects of salmonella infection, including death, health officials have said. CNN's Miriam Falco contributed to this report.